[/caption] I decided to spend a day trying to take some pictures of the falls and creeks along the gorge but I found that most of the vegetation is still fairly sparse and somewhat brown. There are a lot of spring plants and flowers starting to come up but it’s still a few weeks away before it will turn to it’s most notable green of greens. Most of my hike was rain free but once I got above triple falls it started to rain pretty hard. To make things worse, I hit my leg on an old log and gave myself a really bad charlie horse. I spent the rest of the day limping along the trail. This really put a damper on my day. I decided to return to my car and maybe drive towards Hood River to see if the rain might let up. Boy was I wrong! 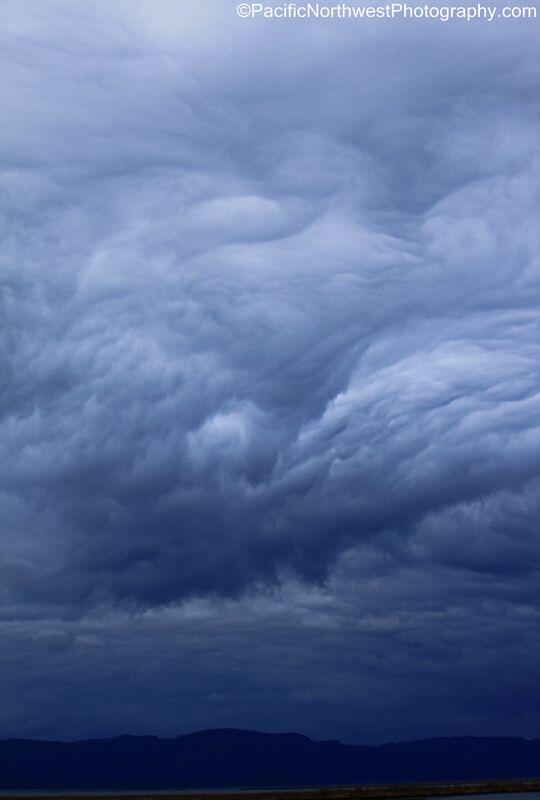 the clouds had thickened and the rain had become even worse. I eventually decided to call it a day and drive back to Portland. The wind was especially bad and the rain progressively got even worse as I drove past Multnomah Falls. I used my ND8 along with my warming filter and my CIR-POL to capture this shot. Since the sun was high enough, there seemed to always be enough light to over expose any of my shots, if I didn’t have my ND8 filter attached. I set my ISO to 200 and my focal length was at 55mm. The F-stop I used was F10 in order to allow enough light in due to the use of the ND8 filter. The shutter time was 1 second while using the Auto Shutter Priority. [/caption] Tuesday’s weather was amazing all over the Pacific Northwest. There was only one problem though. I had to choose between snow-shoeing in the Cascades, hiking along the Columbia River Gorge, walking along the Spring Flowers or visiting the Coast. I chose to visit the coast since I knew that the weather was going to be especially amazing. And I wasn’t disappointed. I haven’t seen weather like this, on the coast, in several years. The sun was positioned perfectly and the blue sky and water made for the easiest of photos. You couldn’t have taken a bad picture even if you tried. I settled on this photo due to the amazing colors in the sky as well as the motion of short sand creek winding it’s way towards the Pacific Ocean. The setting sun really gave the ocean and the creek a really dynamic glow. I set me camera on auto/shutter priority in order to get a really good blurred effect. The F stop was at 25 and the focal length was at 32mm. I stacked several filters on my 18-55mm kit lens. I had my usual uv filter but also added my warming filter, CIR-POL and my ND8. Without my ND filter, I wouldn’t have been able to get the blurred effect like this since the sun was so intense. I had to zoom in a bit in order to keep any of the surfers or beach combers from appearing in the shot. The ISO speed was at 100 and the shutter was at 1 second. I was trying to create a very tranquil setting as to make it look as though this could be a rocky deserted island. I normally only come here to hike and take photos along some of the many rocky cliffs or heavily canopied forest but I decided to try my luck at a sunset shot. I wasn’t disappointed at all. 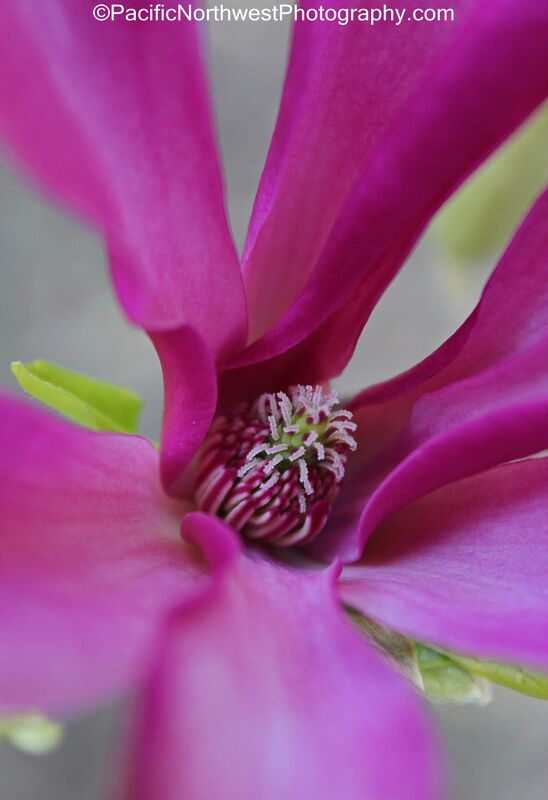 [/caption] I wasn’t sure the name of this flower but I believe it’s called a tulip tree flower. Most of them weren’t open but there were a few that had. I took this at the Portland International Rose Garden on Friday. However, while driving near my house I noticed that there were 5 of the same trees just 800 feet from my front door. I will be photographing more of flower since it’s so interesting. I can’t believe that I never noticed this before. Sometimes you can’t see the forest through the trees. I took this with my 18-55mm kit lens. I removed my CIR-POL so I wouldn’t have camera shake since I didn’t use my tripod. However, I did use my warming filter to bring out the vivid colors. I had my lens at 55mm focal length and I was about 6 inches from the flower. I kept my camera in Auto Exposure with an F-stop of 5.6 and my ISO was at 100. I had taken several pictures while in Flower mode but this one was taken in Auto. [/caption] I can’t believe Spring is officially here. It’s pretty cool to think that soon all of the spring flowers and trees will be blooming. I’ve already snatched every Oregon flower brochure that I could find so I don’t miss any of the spring festivals this year. This will be my first year ever being able to go to one, so I hope to get some really great shots. 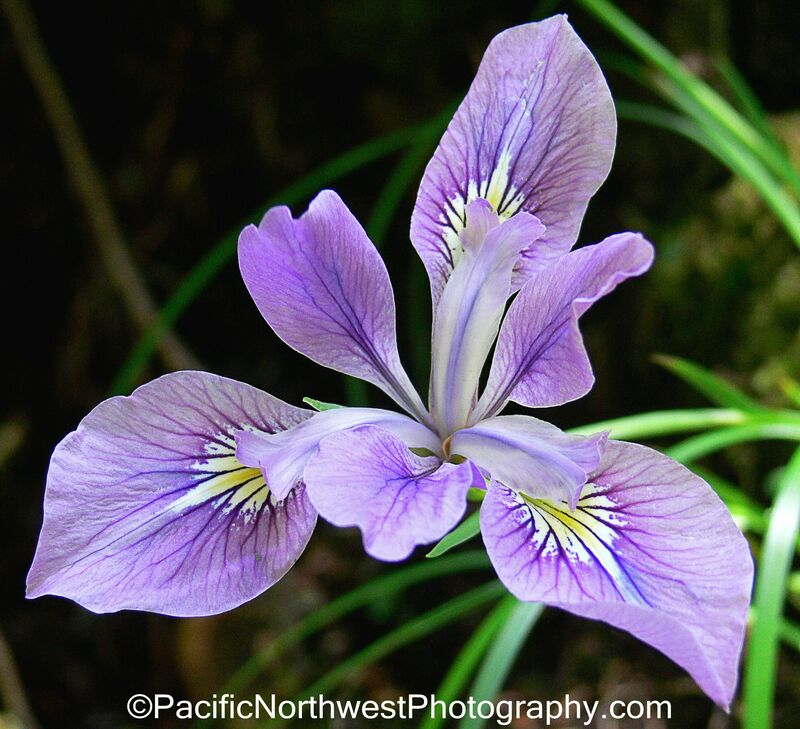 I took this photo of a wild iris about two years ago along the Oregon coast. This was along the South trail of the Cape Lookout trail system. This was back when I was using my Panasonic Lumix point and shoot. I believe I was using a warming filter as well as a CIR-POL. I believe I didn’t even crank up my ISO or the white balance. Even though it was around noon, the lighting was perfect since the trail was shrouded in shade. I didn’t use a tripod on this shot. I was really surprised that this came out since my Panasonic is only a 8mp and is really shaky at close range, even though it has IS. [/caption] I can’t believe it but it seems like I took this photo many years ago. This winter has got to be one of the warmest winters that I can ever remember in the Pacific Northwest. This shot was taken near Johnston ridge just across from Mt. St. Helens. It took me several hours to hike to this spot from Coldwater Lake but I never had much snow to contend with. My snow-shoes weren’t required. I hope to hike hear again one more time before most of the snow melts. On my next trip, I hope to see more of Mt. Adams since it was mostly shrowded in clouds when I was here last time. I never used a tripod to get this photo since the wind was pretty strong and I was just as comfortable lying on my stomach while I rested my elbow in the snow. The view in the crater is awesome from this spot. I could see all of the volcano as well as the vicinity where Mt. Adams is. 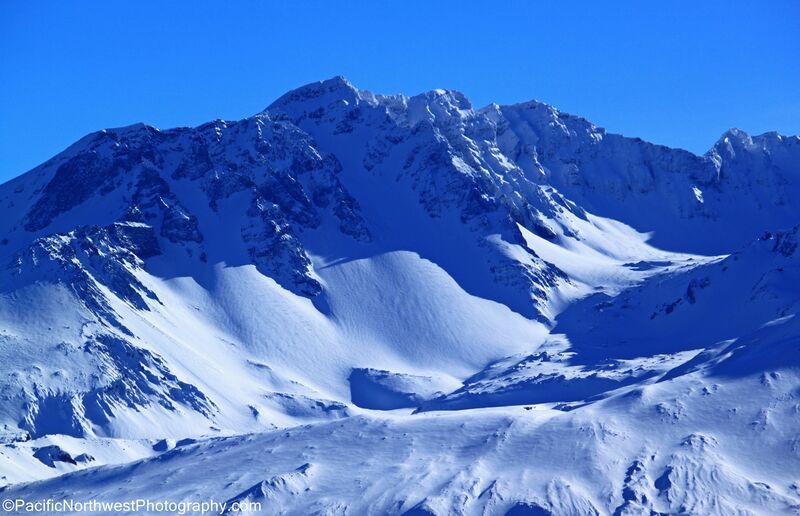 I used my warming filter and my CIR-POL filter to separate the blue sky from the snow and exposed rocks. The warming filter also helped bring out some of the personality of the rock. I used my 50-250mm telephoto lens at about 190mm. This is a great place to view the blast zone and all of the destruction that was caused when Mt. St. Helen’s erupted. 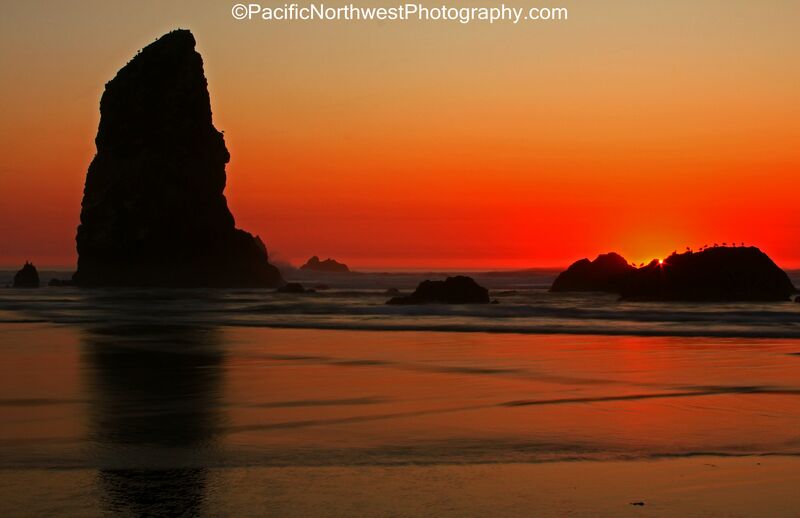 [/caption] Cannon beach is not only one of the best places to photograph sunsets but it’s also one of Oregon’s busiest spots to shoot sunsets. 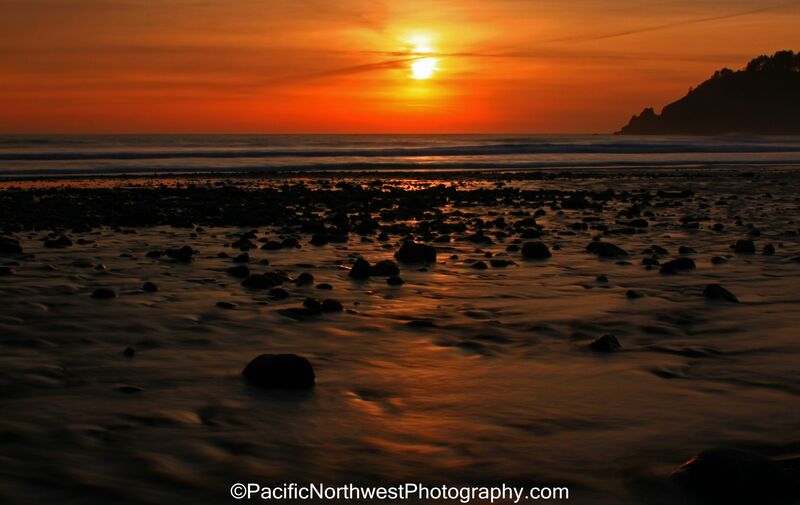 Haystack rock, the needles and the large tide pool makes it a no brainer why its so popular. This is one of the few spots that lure dozens of photographers trying to capture the perfect sunset. I took this shot on 9/09. September is always a great time at the Oregon Coast. The days are long and the weather is usually perfect….Sunny, warm and always offering a great sunset. I usually start with several ND filters and then start removing my filters as the sun sets and it gets darker. I have sometimes stacked two ND filters (8 and 4) along with my warming filter and my CIR-POL filter. The sun is usually so intense that I need to block out the intense glare. 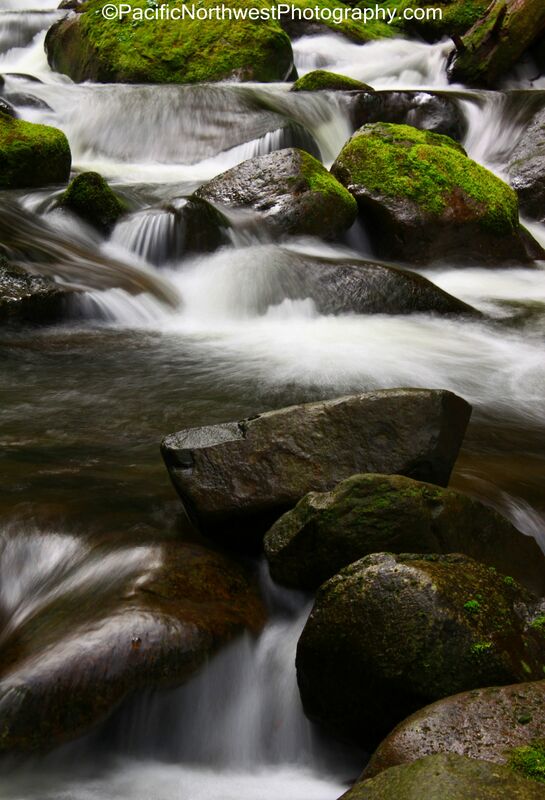 For this picture I had used my ND-8, warming filter and my CIR-POL. I had set the camera on auto with a 1 sec shutter speed. I set my ISO to 100 and F-16. I used my 18-55mm Canon kit lens at 39mm. I have several sunset pictures of the Needles. I usually choose the Needles over Haystack rock since I find them more interesting and they are just past the breakers allowing more personality in your photo choices. [/caption] While driving along the Columbia River, I noticed a sign that ready Eagle Sanctuary. I decided to check it out. There is a small area just off the road where you can view Eagles near the river. There is a small viewing platform and some information about the eagles and when and where to see them. After about 30 minutes of standing in the rain, I noticed that the clouds were starting to make some pretty awesome formations over the Columbia River, looking towards Washington. It was amazing how quickly they were changing shapes and moving east. There was a really fast moving cold front moving from the Pacific ocean towards the valley. I did however manage to take a quick photo of a younger bald eagle from about 50 yards away but it never landed so I wasn’t able to get a good shot. I also did see 4 adult bald eagles but they were too far to get a photo. I was far more amazed to get some shots of these awesome clouds. I used my 18-55 canon lens and set the ISO setting to 200. I did keep my cir-pol lens on but I did increase the AE setting to 2 since it was raining a bit and was thoroughly overcast. [/caption] Who’s ready for Spring? 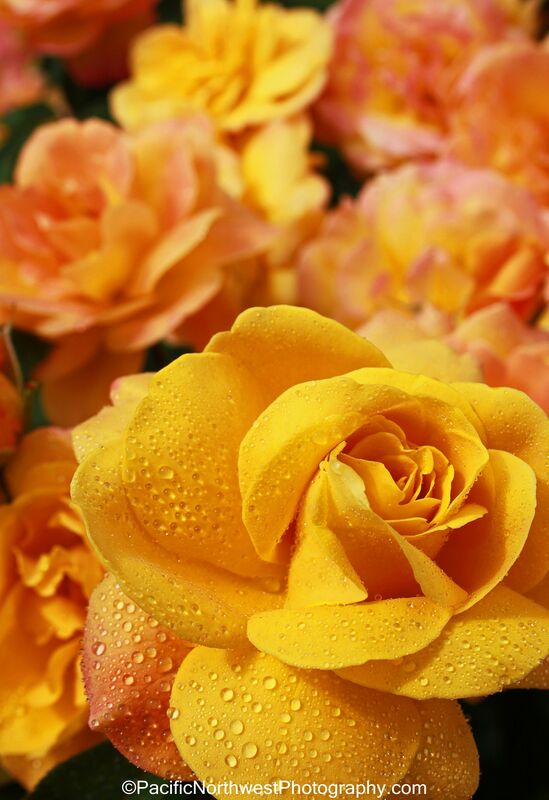 I couldn’t help but include one of my rose shots from last year. I took this shot in early June at the Portland Rose Garden. I sprayed the rose with my water bottle to give it more personality. The sun was pretty high so it really allowed me to avoid any shadows from hiding the pedals. I am really amazed that I’m able to get my best shots without using a tripod. I used my Canon 18-55mm kit lens to take all of my flora shots last year. However, it does have IS. I just make sure to remove my PL-CIR or at least crank up my exposure so I don’t have camera shake. I usually only use my warming filter, which is a must. I’ve really experienced great macro capabilities with this inexpensive little lens. I am able to get just inches from the flowers and still get great shots. During the late summer months, I was able to get some great shots of bees pollinating the flowers. You can even see the pollen on their little legs. I plan on purchasing a 50mm macro lens so I can really get some even better shots of flora during this spring and summer. [/caption] What a difference a day makes. I took this shot on Sunday. My previous two posts were taken on Saturday when there wasn’t a cloud in the sky. However, Sunday was much different. The clouds had moved in from the Pacific which made for some great backdrops when photographing around the piers. I wasn’t able to get as many shots of the ships steaming under the bridge as I would have liked. I’m sure a lot of this had to do with the fact that it was Sunday. 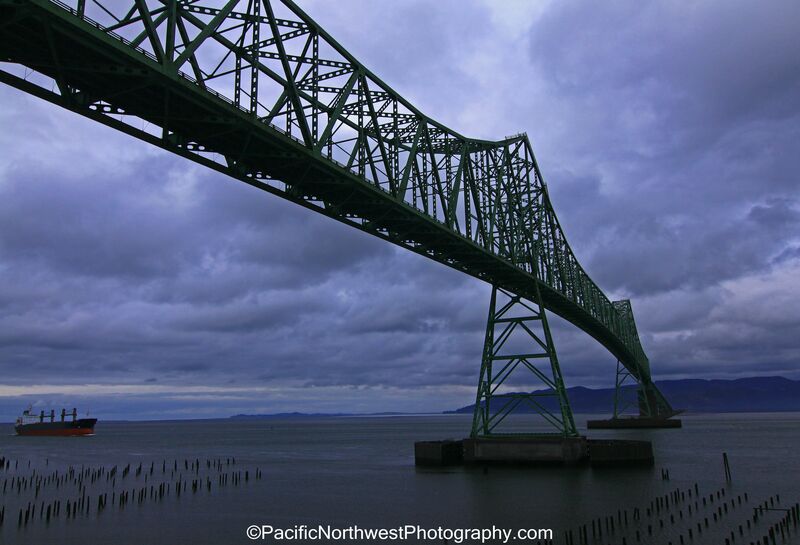 This shot really shows just how massive the Astoria-Megler bridge is. It completely dwarfed all of the ships that traveled under it. Again, I was blessed with great light. I was able to set my Exposure comp./AEB setting to between 0 and 1. I used my warming filter and PL-CIR to ensure that the exposure and composition were perfect. The only time I really had to increase the exposure was when I was directly under the bridge. I never had to use my tripod, which allowed me to cover a lot of ground along the piers and also allowed me to take a lot of photos. 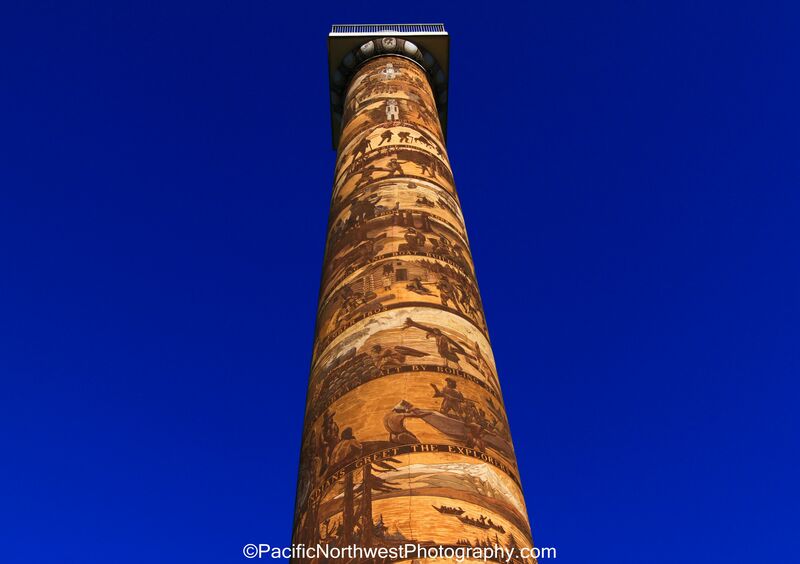 [/caption] Blue sky and the Astoria Column. This photo was taken last Saturday. The sky was so blue that I had to include this photo on my blog. I have never seen the sky look so blue. You would never believe that this was taken in early March. I used my wide angle lens to capture the awesomeness of the column and I cropped the photo to remove some of the blue sky. This way I could include more of the column in the shot. As you can see, there wasn’t a cloud in the sky the entire day. However, it was windy and a little chilly at the top of the column.